② Please select the eleksdraw machine in EleksCam software. ③ Please Set the ON/OFF number to 25, NOT 1000. Please note them. Ortherwise it might damage the servo.Please make sure you know before you bid. Thank you. This newest drawing robt will replace of your hands to finish this works just by the fool-style open source software (EleksCAM,Inkscape) controlled. It is an extremely versatile machine, designed to serve a wide variety of everyday and expert drawing and writing needs on almost any flat surface. It allows you to use your computer to produce writing that appears to be handmade, complete with the unmistakable appearance of using a real pen (as opposed to an inkjet or laser printer) to address an envelope or sign your name. And it does so with precision approaching that of a skilled artist, and — just as importantly — using an arm that never gets tired. 3. Eleksdraw can compatible with laser engraving mode, you can add a laser module instead of pen (up to 2500mw, while 5500mW laser module is too large in size to be installed). We recommend the EleksMaker Original Laser Module, please check it: 500mW Laser Module, 2500mW Laser Module. 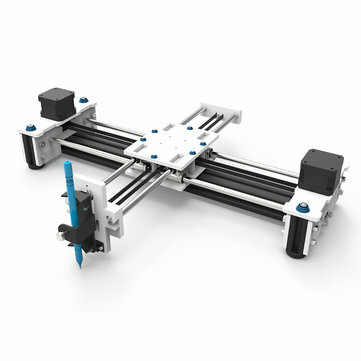 ● This kind of the drawing machine without laser module, you can equip laser module with the machine by yourselves.